SteelSeries has announced full Fortnite compatibility across all its mobile controllers including the new Stratus Duo, Stratus XL and Nimbus. This comprehensive family of critically acclaimed controllers is ready for Fortnite on mobile or PC. The $59.99Stratus Duo (pictured) is SteelSeries’ newest full-size multi-platform controller. Gamers can swap between the Bluetooth connection for mobile gaming on Android, Oculus Go, and Samsung VR and the low latency 2.4GHz wireless connection for gaming on Windows. The Stratus Duo mirrors the familiar size and layout of console controllers but sports an upgraded design from the Stratus XL with a new trigger design featuring Magnetic Hall Effect sensors that keeps triggers consistent and precise, according to Tino Soelberg, SteelSeries’ chief technical officer. The controller also includes high performance clickable analog joysticks. The controller is powered by a lithium ion battery for 20-plus hours of play time and includes a Micro USB cable that is 1.8 meters/5.9 feet in length. 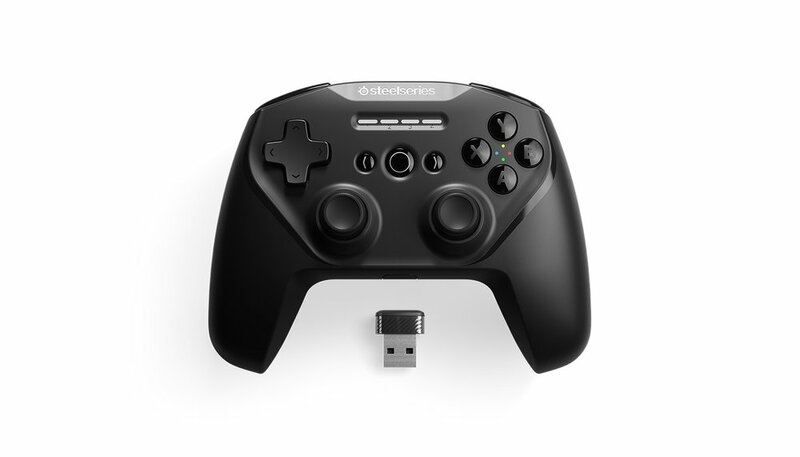 Of more interest to Apple fans is the $49.95 Nimbus, a game controller for Apple TV, iOS, and Mac. It’s a full-sized wireless controller perfect for playing Fortnite on iPhone or iPad. The ergonomic shape and familiar button placement of the Nimbus makes it simple for users to jump right into Fortnite or hundreds of other games like Minecraft, says Soelberg. The $59.99 Stratus XL is a Bluetooth gaming controller for Android and Windows. It includes 40-plus hours of gameplay with two AA batteries, LED notification, clickable joysticks and complete customization. The entire SteelSeries controller line is compatible with the new $9.99 SmartGrip accessory. The SmartGrip is an adjustable phone mount that clips on to the controllers and holds gamers’ phones in place while gaming on the go.